The sequence began Tuesday and will culminate with firing the craft's main thrusters for about 27 minutes on Friday -- a foot on the brakes to reduce velocity by about 20 percent as the spacecraft swings around Mars at about 5,000 meters per second (about 11,000 miles per hour). Mission controllers at NASA's Jet Propulsion Laboratory, Pasadena, Calif., and Lockheed Martin Space Systems, Denver, are monitoring the events closely. "We have been preparing for years for the critical events the spacecraft must execute on Friday," said JPL's Jim Graf, project manager. "By all indications, we're in great shape to succeed, but Mars has taught us never to get overconfident. Two of the last four orbiters NASA sent to Mars did not survive final approach." 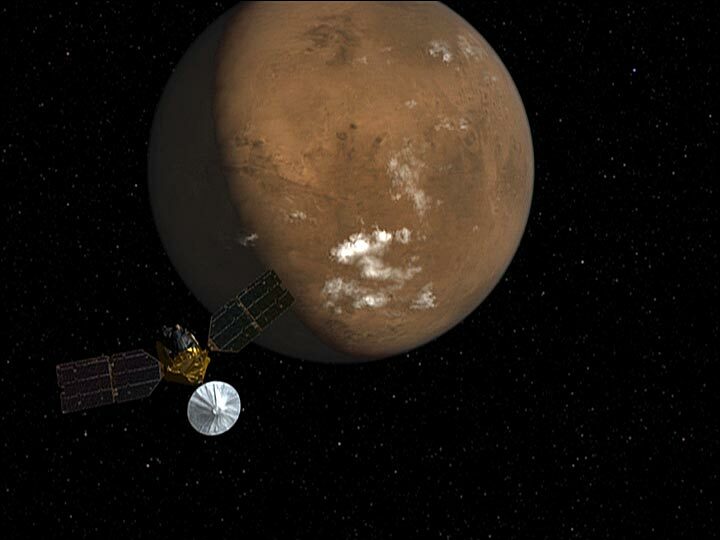 Mars Reconnaissance Orbiter will build upon discoveries by five successful robots currently active at Mars: NASA rovers Spirit and Opportunity, NASA orbiters Mars Global Surveyor and Mars Odyssey, and the European Space Agency's Mars Express orbiter. It will examine Mars' surface, atmosphere and underground layers in great detail from a low orbit. It will aid future missions by scouting possible landing sites and relaying communications. It will send home up to 10 times as much data per minute as any previous Mars mission. First, it must get into orbit. The necessary thruster burn will begin shortly after 1:24 p.m. Pacific Time on Friday. Engineers designed the burn to slow the spacecraft just enough for Mars' gravity to capture it into a very elongated elliptical orbit. A half-year period of more than 500 carefully calculated dips into Mars' atmosphere -- a process called aerobraking -- will use friction with the atmosphere to gradually shrink the orbit to the size and nearly-circular shape chosen for most advantageous use of the six onboard science instruments. "Our primary science phase won't begin until November, but we'll actually be studying the changeable structure of Mars' atmosphere by sensing the density of the atmosphere at different altitudes each time we fly through it during aerobraking," said JPL's Dr. Richard Zurek, project scientist for the mission.